Teachers Training to TS Model schools, KGBVs, Tribal welfare, Residential School Teachers 2017, Teachers Training Schedule, Training to Model Schools, KGBVs, Tribal welfare, all type of Residential teachers in june 2017,TS Teachers Training. 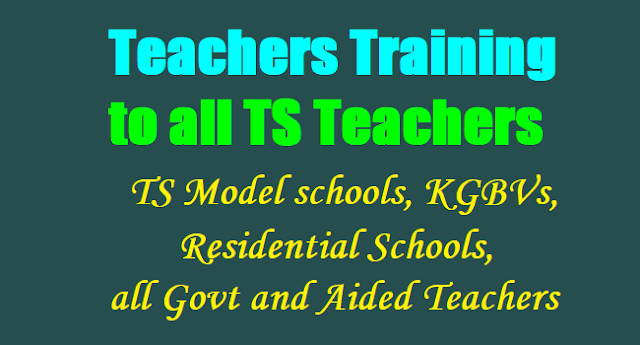 Telangana/TS Teachers Training Programs 2017 to Teachers: TS Model Schools, KGBVs, Tribal welfare, All type of Residential teachers Training Schedule. Telangana C and Director of School Education Department is going conduct training programmes to In-service teachers in this academic year. These training programs will be conducted for Model Schools, KGBVs, Tribal welfare and all type of residential teachers, Govt and Aided School Teachers. Sub: RMSA Telangana Hyderabad - Teacher training programme in various subjects during June 2017 - Inclusion of teachers working in Model Schools, KGBVs, teachers under management of Tribal Welfare, all types of residential schools, Govt. aided schools - Orders issued - Reg. Ref: Proceedings of C&DSE Re. No. 107 /C&T/SCERT /TS/2017, dated: 16.05.2017, 18.05.2017, 19.05.2017. All the District Educational Officers in the State are hereby informed that, vide ref. cited orders have been issued for conduct of 4-day training programme to the teachers for the academic year 2017·18 during month of June 2017 i.e. pt June to 11th June 2017 in various batches i.e. 2nd to 5th June 2017 (1st spell), 7th to 1Qth June 2017 (2nd spell). c. 2nd Spell: 7rh - 10th June, 2017. In this regard all the DEOs are directed to include the teachers working in Model Schools, KGBVs, teachers under management of Tribal Welfare, Govt. aided schools in the training programme. The DEOs are directed to inform the concerned managements to relieve the teachers to undergo training programme as per the schedule already communicated vide ref. cited. Training on the use of K-YAN’s to Model schools, KGBVs Teachers, Implementation of Digital class rooms, TSSA, MHBD instructions. training manual to each teacher. Proc. Rc. No. Spl/B4/2016 Date: 16.12.2016; Sub :- SSA, Mahabubabad - Implementation of Digital class rooms - Training on the use of K-YAN’s by IL&FS Education to the teachers of Model schools and KGBVs - Instructions issued - Reg. Ref :- 1. Letter from Mrs.Sujatha, IL&FA Education and Technology Services, Dated:09.12.2016. 2. Proc of the Director of School education& Ex-Officio Project Director, TSSA, Hyderabad No Rc.No.307/B1/RMSA/TS/2016, Dt; 09.12.2016. In the reference 2nd cited, the Director of School Education Ex-Officio Project Director, SSA, TS, Hyderabad has informed that it has been proposed to provide training to all the teachers of Model Schools and KGBVs (except Hindi where digital content was not provided) on the use and operation of K-YAN’s and informed that the Principals of Model Schools and KGBVs will depute all the teachers to the training on K-YANs at the training venue. The Principals of the training venue are requested to arrange working lunch and tea to the participants. Every teacher in the training must operate K-YANs. The K-YAN representative trainer is requested to provide a copy of the training manual to each teacher attending the training and also collect a copy of attendance sheet of participants and furnish the same to the O/o the Director of School Education, TS, Hyderabad and further informed that during the training, the subject videos need to be screened and explained so as to make the teachers to load the content and use the content. Wherever Internet Connection/ Data card is available the interactive board need to be used and explained its features. The trainers need to be carry a Data Card to show the use of interactive board. In view of the instructions of the Director of School Education Ex-Officio Project Director, SSA, TS, Hyderabad, the venue selected and teachers handling English, Mathematics, Physical Science, Bio Science, Social working in the schools to be attended to the training is furnished as follows. The Principals of Model School and Special Officers of KGBV Schools mentioned above are requested to depute the teachers working in their schools handling English, Mathematics, Physical Science, Bio Science, Social to the venue mentioned above with instructions to report before the Principal of Venues allotted to them on 20.12.2016 by 9.30 am. The Principal, TSMS Mahabubabad requested to provide accommodation, working lunch and tea to the participants. The receipt of these proceedings shall be acknowledged forthwith.